Geppetto’s Skate Shop is a retail shop specializing in ice figure skate boots, blades, and sharpening for both the beginner and serious competitive skater. We do not sell any figure skating clothing, i.e. skirts, warm up, or competitive dresses. Due to the nature and importance of how boots should fit and blades mounted, we carry very little stock inventory on hand. We believe every foot to be as different as one's unique personality and should be treated as such. Mr. Edge has been fitting and sharpening skates since 1978 and believes in the importance of injury prevention. One way for skaters to avoid injury is by having a properly fitted boot, blade mounting, and sharpening throughout their entire skating career. Note: Boots and blades can be purchased separately. If a skater does not fit well into one particular brand of boot, they have the option to purchase a separate boot and blade. When doing so, expect to pay a remounting fee. Here at Geppetto’s, we constantly switch boots and blades around in order to provide the best possible fit for the beginner and beginning freestyle skater; all at an affordable cost to the skater. Skate laces come in both all nylon and a cotton/nylon blend 50/50. All nylon laces tend to stretch and loosen up quickly while 50/50 laces will hold tighter together while skating. All nylon laces are good to use for breaking in new skates as they will allow the skater to bend much easier while breaking in their new skates. After breaking in new skates, it is recommended that a skater switch to the 50/50 blend laces. Ankle sleeves have many different uses, not only for figure skaters, but the general public as well. 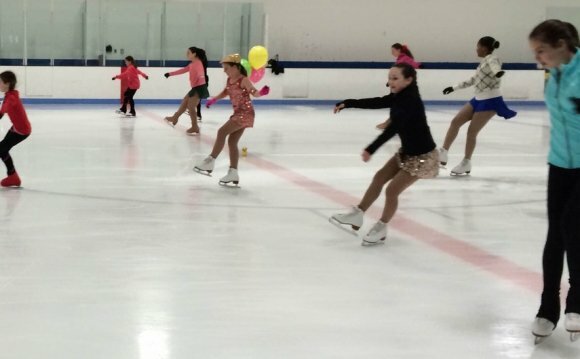 Figure skaters whose ankle bones are hurting will find relief from their pain when placing them around their ankles. They can also be used to help take up room in the ankle area of a skating boot or be used to snug up the heel area in a boot. Aside from skating, ankle sleeves can be used around the forearm of an individual suffering from a radial nerve problem. The pressure that the ankle sleeve applies while on the forearm helps to hold the radial nerve in place, thus helping to eliminate some of the numbness or tingling sensation that people sometimes feel in their fourth and fifth fingers. All tights come in children through adult sizing and are available year round. The original SK8Tape made by Penguin Specialties is used mostly by Synchro teams needing to change the color of their skates. SK8Tape is the best product on the market for doing this type of job. Original brand Sk8Tape in: White (narrow and wide). Skate taping is also available for an additional charge.